Can Scuba Diving Be Done By Non-Swimmers? Scuba diving is one of the most beautiful and exciting water activity that you will ever take part in. he feeling of being blanketed by water, watching sea life and walking merrily without the fear of being drowned is thrilling. As an avid scuba diver, there is one question that I hear from people who have never gone before. “Can scuba diving be done by non-swimmers?” And as usual, I only give one type of answer “Of course yes, you should give it a try!” What I know for sure is that anyone one of the right age can do scuba diving and am not saying it just to humor anyone. Honestly, anyone can do it just fine with a bit of practice and enthusiasm. Despite their swimming level. For the years that I have been diving, I have seen so many non-swimmers do scuba diving so well. Some even pick up just after a couple of lessons. This is because of the excitement and the determination they have to explore the underwater world. You don’t need to be a genius; you just need to be very interested in Scuba diving. The first time is much more different since it is more of learning than exploring. You will find that there are numerous devices that you need to know how to use. There is the gear, the weights and the buoyancy control device whose work is to keep you afloat. You will also be required to undertake the PADI program to learn the basic devices and their functionalities. 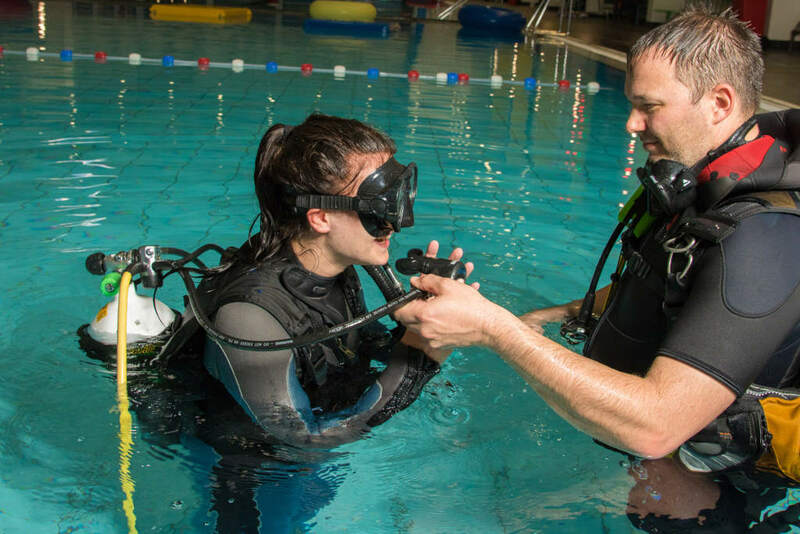 Once you have grasped them, you will be asked some questions and allowed to take your first step in water as a scuba diver. Well, while in the water you will need nothing else but a positive attitude. Your fear or comfort level will be triggered by your attitude. I always tell first timers that having a positive attitude when underwater is one of the things you can give to yourself. It will not only keep you relaxed but also enable you to learn the ropes much faster. Your mind will be at ease, and this will make you become in control of the environment around you. Why Are Swimming Skills Different Than Scuba Diving? Well, this will take us back to the question can non-swimmers do scuba diving? What you should know is that scuba diving is all about treading in deep waters while swimming, on the other hand, is all about remaining afloat on water. As you can see, these two are much more different. With scuba diving, you don’t have to know anything about swimming. After all, if you want to float, there is the buoyancy control device for that. However, if you want to advance, you will be taught how to use your legs to remain afloat, so that in case the floating device malfunctions, you can still go around the problem. I hope that has answered the most asked question can scuba diving be done by a non-swimmer? Once you are through the training and you are equipped with the right skills to take you through a basic scuba diving, you can now start enjoying every bit the waters has to offer. You will have to pick a spot that offers scuba diving and go for your deep sea exploration. My first scuba diving adventure was incredible! There is a whole lot of adventure underwater just like on land. All that was going through my mind is “what is this, what is that and how is this possible!” The surface is incredible, and the sea animals are just fantastic. If at all you fear scuba diving, you can use this imagination to kick out the fear in you. You will be advised to go in groups for company purposes. This will keep you safe throughout your underwater escapade. Scuba diving is a very fun adventure, for once you get to leave the normal world that you are used to and for the first time you get to meet a whole new biosphere. All you need is the PADI training program to learn the ropes, and after that, you will be good to go. For those wondering “can scuba diving be done by non-swimmers?” You have your answer. Swimmer or no swimmer, you can do scuba diving without any problems.